It can happen to even the most experienced winemakers. Your fermentation is cruising along as planned and the Brix levels are decreasing predictably. Then, you go to check the Brix and note that it hasn’t changed from the last time you measured. Another check a few days later reveals that the sugar levels are no longer dropping, and the fermentation is STUCK. Fermentation temperature was too high or too low for the yeast. Too much sugar in the must (alcohol level became too high for the yeast). Lack of nutrients in the must. pH too low due to unripe grapes or a high amount of Volatile Acidity (VA). Here at The Beverage People, high Brix levels and a lack of nutrients in the must seem to be the most common issues. Late season harvesting is especially vulnerable to stuck fermentations due to the potential over-ripeness of the grapes. A heat wave like we had in Sonoma County early on in 2017 harvest can also pre-maturely drive up the sugar content in the grapes catching the winemaker off guard and unprepared to harvest at an appropriate sugar level. Zinfandel grapes are notorious for shriveling on the vine, turning to raisins which then increase the Brix levels in the must over the course of a day or two of soaking in the juice. So even if your Brix levels are O.K. when you measure at crush, they could ‘soak up’ to unacceptable levels by the time fermentation becomes active. High alcohol meads can also be problematic, if an alcohol tolerant yeast is not used in combination with additional nutrients. 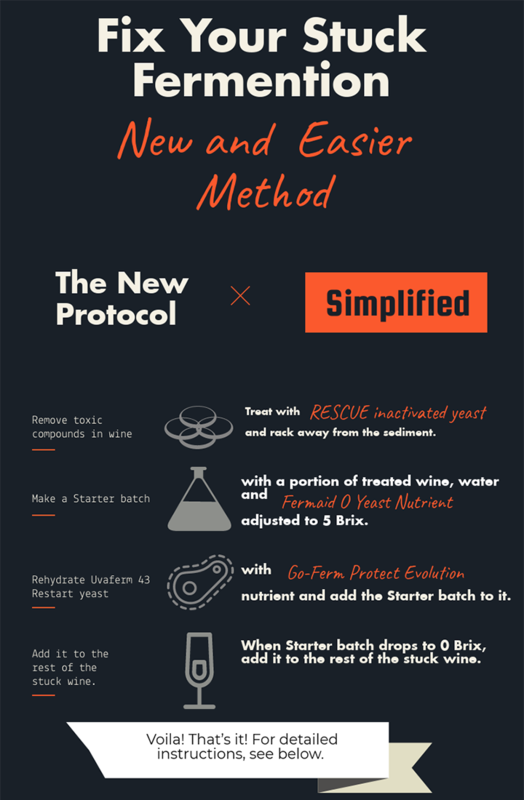 Previous versions of protocols for restarting stuck fermentations have been horribly difficult to comprehend, much less implement, especially on the home winemaking scale. One ‘popular’ protocol called for splitting your batch of wine into 5 smaller batches and then slowly introducing them over time to a successfully restarted smaller batch. Most require strict time and temperature parameters and a dizzying number of calculations and products. Luckily Scott Labs has introduced a new simplified method that doesn’t require splitting the volume multiple times and can be done in four efficient steps. The New Protocol - Simplified! 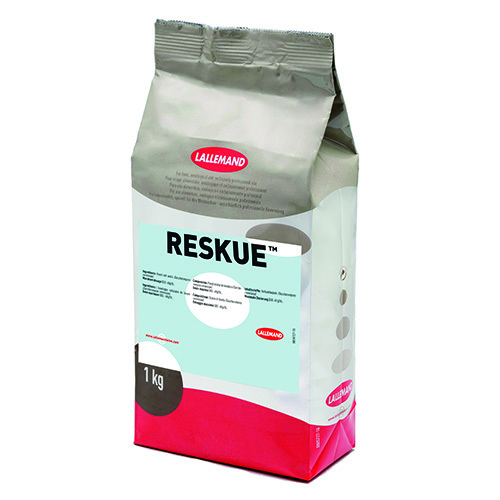 Reskue™ yeast hulls are specific inactivated yeast for treating stuck fermentations. They help absorb the toxic compounds created during fermentation. How to Use: Suspend Reskue in 10 times its weight of clean 86–98°F water and mix. Wait 20 minutes then add to stuck or sluggish fermentation. For stuck fermentations, allow Reskue to settle for 48 hours then rack off and reinoculate with a restart yeast. The Beverage People package Reskue in 20 and 100 gram bags. 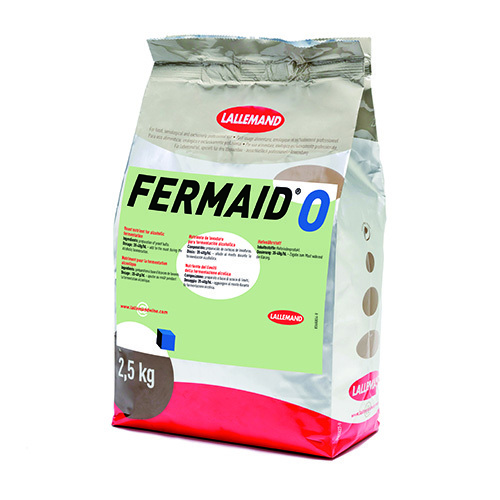 Fermaid® O is an organic autolyzed yeast nutrient with a high content of organic nitrogen (amino acids). Unlike its cousin Fermaid K, Fermaid O does not have Diammonium Phosphate (DAP). How to Use: Fermaid O should be mixed with room tem­perature water. The amount of water used is not critical. Simply add enough to make a slurry, then add to wine. The Beverage People package Fermaid O in 100 and 500 gram bags. Go-Ferm Protect Evolution ® is an organic yeast rehydration nutrient for difficult or stuck fermentations. It is the result of a multi-year study of prob­lem fermentations by Lallemand and National Agricultural Research Institute (INRA) in France. 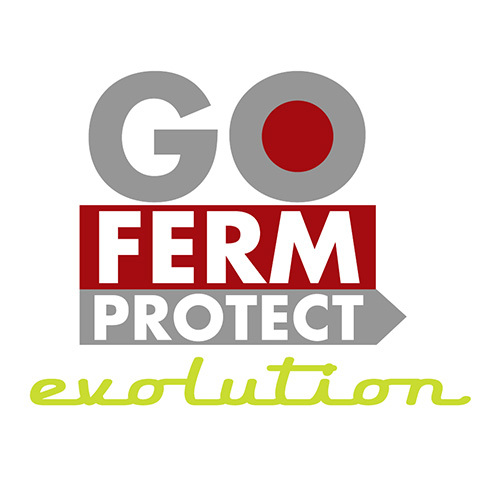 Go-Ferm Protect incorporates sterols and polyunsaturated fatty acids (for cell protection) together with vitamins and minerals to help ensure yeast survival and to help main­tain fermentation activity to completion. How to Use: Mix Go-Ferm Protect in 20 times its weight in clean 110°F water. Let the mixture cool to 104°F then add yeast. Let stand for 20 minutes. Slowly (over 5 minutes) add equal amounts of must (juice) to be fermented to the yeast slurry. Watch the temperature. Do not allow more than 18°F difference between the must (juice) and the yeast slurry at the time of mixing or the yeast may be shocked. The Beverage People package Go-Ferm Protect Evolution in 100 and 500 gram bags. Uvaferm™ 43 Restart is notable for its powerful ability to restart stuck or sluggish fermentations due to high alcohol tolerance (18%+ v/v) and low relative nitrogen needs. It has high resistance to the stressful conditions in stuck fermentations. The Beverage People package Uvaferm 43 Restart in 10 gram vials and 4 ounce (112 gram) bags. Add SO2, and/or lysozyme if lab tests reveal spoilage issues. Add 15 grams Reskue to 150 mL of clean 86–98°F water and mix. Wait 20 minutes then add to stuck fermentation. Allow Reskue to settle for 48 hours then rack away from sediment. Prepare the starter batch of wine. Adjust Brix to 5° (with sterile grape concentrate or corn sugar to sweeten; sterile water to dilute). Rehydrate yeast and add to starter batch. Add 20 grams of Go Ferm Protect Evolution in 400 mL of water at 110°F. Cool solution to 104°F and add 15 grams of Uvaferm 43 Restart. Wait 20 minutes and slowly add the starter batch to the rehydrated yeast. Incorporate finished starter batch to the rest of the stuck wine. Allow starter batch to drop to 0°B and transfer immediately to the remaining stuck Reskue treated wine. Add 15 grams of Fermaid O slurry. Mix to homogenize. DONE! The stuck wine should now be on its way to dryness. With a little patience, persistence and the right products, you too can get out of a sticky fermentation situation. Don’t forget that The Beverage People are here to help. We can assist you in calculations and logistics to fix your stuck fermentation. 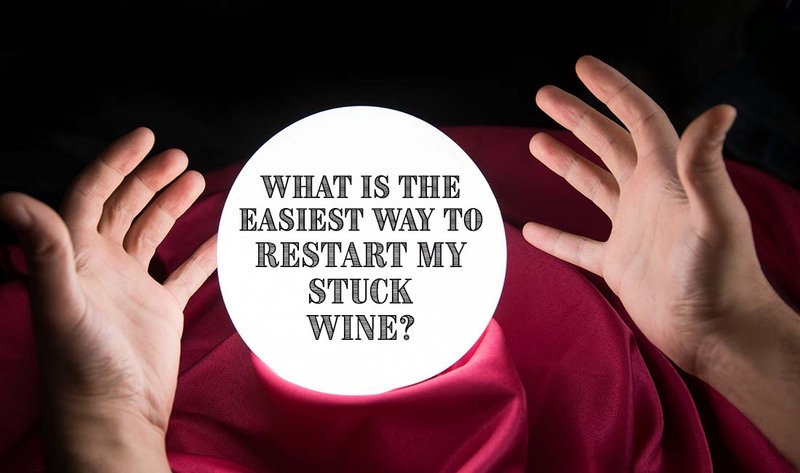 We can also give advice on ways to avoid a stuck fermentation in the future.